ActionGroup - a group of actions. ActionGroup represents a group of actions. Each action in the group has a unique name (which is a string). All method calls, except list_actions() take the name of an action as an argument. The GActionGroup API is meant to be the 'public' API to the action group. The calls here are exactly the interaction that 'external forces' (eg: UI, incoming D-Bus messages, etc.) are supposed to have with actions. 'Internal' APIs (ie: ones meant only to be accessed by the action group implementation) are found on subclasses. This is why you will find – for example – get_action_enabled() but not an equivalent set() call. Emits the ActionGroup::signal_action_added() signal on action_group. This function should only be called by ActionGroup implementations. action_name The name of an action in the group. Emits the ActionGroup::signal_action_enabled_changed() signal on action_group. enabled Whether or not the action is now enabled. Emits the ActionGroup::signal_action_removed() signal on action_group. 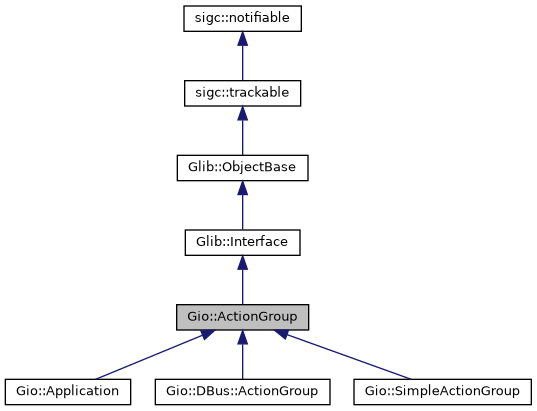 Emits the ActionGroup::signal_action_state_changed() signal on action_group. state The new state of the named action. Activate the named action within action_group. If the action is expecting a parameter, then the correct type of parameter must be given as parameter. If the action is expecting no parameters then parameter must be nullptr. See g_action_group_get_action_parameter_type(). action_name The name of the action to activate. parameter Parameters to the activation. Request for the state of the named action within action_group to be changed to value. The action must be stateful and value must be of the correct type. See g_action_group_get_action_state_type(). This call merely requests a change. The action may refuse to change its state or may change its state to something other than value. See g_action_group_get_action_state_hint(). action_name The name of the action to request the change on. action_name The name of the action to query. Whether or not the action is currently enabled. Queries the type of the parameter that must be given when activating the named action within action_group. When activating the action using g_action_group_activate_action(), the Variant given to that function must be of the type returned by this function. In the case that this function returns nullptr, you must not give any Variant, but nullptr instead. Queries the current state of the named action within the action group. If the action is not stateful then a null Variant will be returned. If the action is stateful then the type of the return value is the type given by get_action_state_type(). value This will be set to the current state of the action. Requests a hint about the valid range of values for the state of the named action within the action group. If a null Variant is returned it either means that the action is not stateful or that there is no hint about the valid range of values for the state of the action. If a ariant array is returned then each item in the array is a possible value for the state. If Variant pair (ie: two-tuple) is returned then the tuple specifies the inclusive lower and upper bound of valid values for the state. value This will be set to the state range hint. Requests a hint about the valid range of values for the state of the named action within action_group. If nullptr is returned it either means that the action is not stateful or that there is no hint about the valid range of values for the state of the action. If a Variant array is returned then each item in the array is a possible value for the state. If a Variant pair (ie: two-tuple) is returned then the tuple specifies the inclusive lower and upper bound of valid values for the state. The return value (if non-nullptr) should be freed with Glib::variant_unref() when it is no longer required. Queries the type of the state of the named action within action_group. If the action is stateful then this function returns the VariantType of the state. All calls to g_action_group_change_action_state() must give a Variant of this type and g_action_group_get_action_state() will return a Variant of the same type. If the action is not stateful then this function will return nullptr. In that case, g_action_group_get_action_state() will return nullptr and you must not call g_action_group_change_action_state(). The state type, if the action is stateful. Queries the current state of the named action within action_group. If the action is not stateful then nullptr will be returned. If the action is stateful then the type of the return value is the type given by g_action_group_get_action_state_type(). The current state of the action. Checks if the named action exists within action_group. action_name The name of the action to check for. Whether the named action exists. Lists the actions contained within action_group. A nullptr-terminated array of the names of the actions in the group. This is a default handler for the signal signal_action_added(). This is a default handler for the signal signal_action_enabled_changed(). This is a default handler for the signal signal_action_removed(). This is a default handler for the signal signal_action_state_changed(). Queries all aspects of the named action within an action_group. This function acquires the information available from g_action_group_has_action(), g_action_group_get_action_enabled(), g_action_group_get_action_parameter_type(), g_action_group_get_action_state_type(), g_action_group_get_action_state_hint() and g_action_group_get_action_state() with a single function call. The first is the improvement in efficiency that comes with not having to perform repeated lookups of the action in order to discover different things about it. The second is that implementing ActionGroup can now be done by only overriding this one virtual function. If the action exists, true is returned and any of the requested fields (as indicated by having a non-nullptr reference passed in) are filled. If the action doesn't exist, false is returned and the fields may or may not have been modified. enabled If the action is presently enabled. parameter_type The parameter type, or nullptr if none needed. state_type The state type, or nullptr if stateless. state_hint The state hint, or nullptr if none. state The current state, or nullptr if stateless. true if the action exists, else false. action_name The name of the action in action_group. enabled Whether the action is enabled or not. value The new value of the state.